Obituary for Maggie G. (Goodwin) Hector | Collins Funeral Home, Inc.
Mrs. Maggie Roberta Goodwin Hector, daughter of the late Johnnie Goodwin and Daisy Scott Goodwin, was born in Kershaw County, August 31, 1920. She is the fourth among twelve children born to this couple. Maggie joined the St. John Baptist Church at an early age and served faithfully until her health began to fail. She loved her church and was actively involved in many auxiliaries. She served as a Sunday School teacher for the youth and helped organize the first vacation bible school. She was active in the missionary society, Board of Deaconess, the Pastor Aid Club and the Sunshine Club. She served on the building committee and was influential in getting the present church built in the early 1970’s. Maggie (fondly called Berta by her family and friends) was educated in the public schools of Kershaw County. After graduating from high school, she received the B.S. degree in Elementary Education form Morris College, and a Master of Science degree from North Carolina Central University, Durham, N.C. Her professional career as a teacher began in the public schools of Horry County, at Whittemore Elementary School, where she taught second grade for fourteen years. She became a vibrant part of the Conway community, touching the lives of many boys and girls, earning their respect, as well as the respect of parents and community leaders. Maggie returned to Kershaw County in 1960 and was employed as a teacher in the Kershaw County School District until her retirement. Maggie was the heart of her family and the glue that bonded the family on a strong foundation. Her open heart, generous spirit, and her kindness touched everyone who knew her. She was the caregiver of many of her family throughout her life, showing great sacrifice and love. She adored her nieces and nephews, giving them much love and affection and being a second mother to all of them. In her lifetime she was a beloved daughter, sister, friend, aunt, grandmother, and great-grandmother. She leaves a legacy of loving and giving among her family and the community. Dedicated to the teaching profession for 38 years, Mrs. Hector encouraged, inspired, and influenced many boys and girls in the classroom. After her retirement her heart remained committed to help boys and girls find success in learning. This could be seen as many flocked to her home after school for tutoring or for help with school projects. She never turned a child away who needed help. She was a strong advocate for higher education, encouraging young people to continue their education beyond high school. Mrs. Hector was active in many community and civic organizations. She held membership in the South Carolina Education Association, the National Education Association, the Kershaw County Retired Teachers Association, the NAACP, and the Matthew Community Center. Mrs. Hector was preceded in death by her parents and eight brothers. During her illness, Mrs. Hector was blessed with a team of loving and compassionate caregivers: Ethel Anderson, Bertha Spann, Ann Franklin, Martha Halley, Vermelle Green, Willene Senior, and two special caregivers Isa Wood and Meranda Coe, whom she regarded as her adoptive daughters. We believe that their outstanding care and love contributed to her survival during many years of illness. Those left to cherish her fond memories include her three sisters: Cecelia Richardson (Florence, SC), Frances Weldon (Paul) Columbia, SC, and Daisy James (Camden, SC), and a host of nieces and nephews. 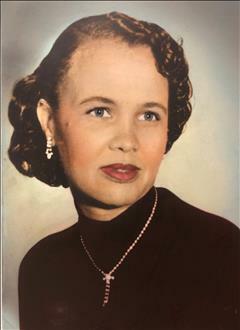 Other loved ones include a special lifelong friend and confidant, Zinie Lewis, of Camden; a special niece (granddaughter), Tiffany Lee, whom she cared for every summer; and a 2nd grade student, Preston Mckever Floyd, who remained in touch with his teacher all of his adult life, sending flowers, and making periodic visits.